I made several (and I mean several) projects for Christmas and other occasions. My work ranges from calligraphy and ink art to knitting and sewing. So with that said, here come the photos of projects that I could not post until after people received them. If you are interested in anything, please contact me at penandinkwell@yahoo.com and we can chat! I repurposed a "Smuckers brand" jar to make a soap dispenser! First I lacquered the labels so that they could withstand water. I know labels are sometimes hard to remove but I imagine that when you want one to stick, they come off! Next I drilled a hole in the top and inserted the pump. Using expandable Gorilla Glue I bonded the pump to the inside of the lid. Voila! Pretty cute if I do say so. 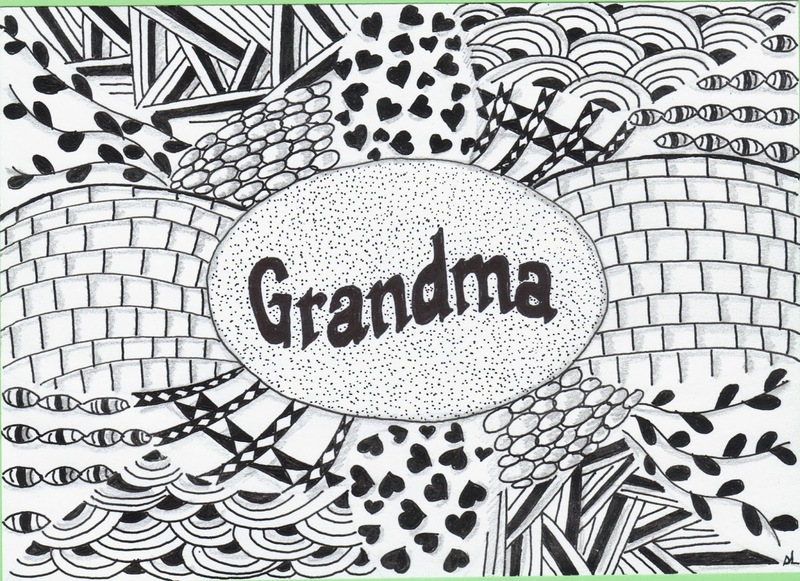 This is an ink art project on white card stock for Grandma. No two projects are alike. This is a 5" x 7" design which I then framed. This is my 2013 Christmas card. Starting with white card stock, I then punched snowflakes in red scrapbook paper. I glued that to the card stock. 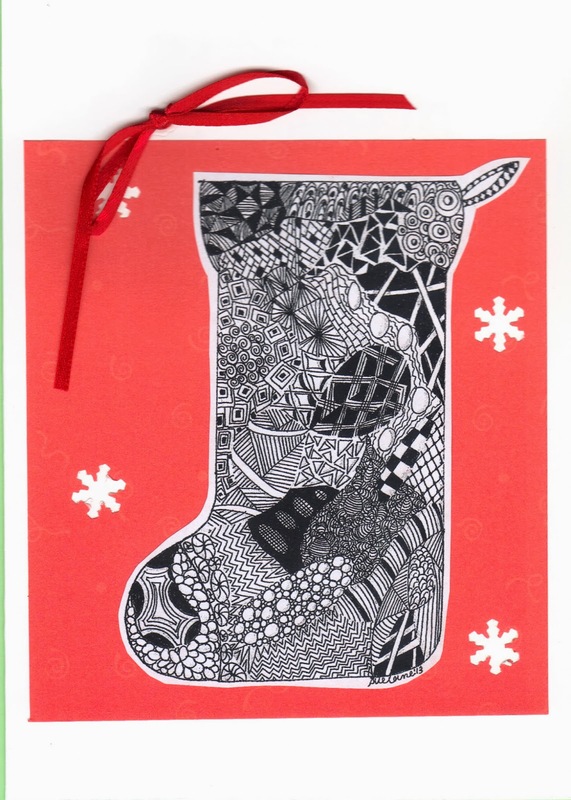 On top of that is an ink art design of a stocking. The card is finished off with a red grosgrain ribbon. I lettered the inside of the card with red ink and created a verse for my recipients. This is a sweet little girl that I wanted to spoil. I knit her a yellow super-soft blanket (which I have posted earlier in the blog). 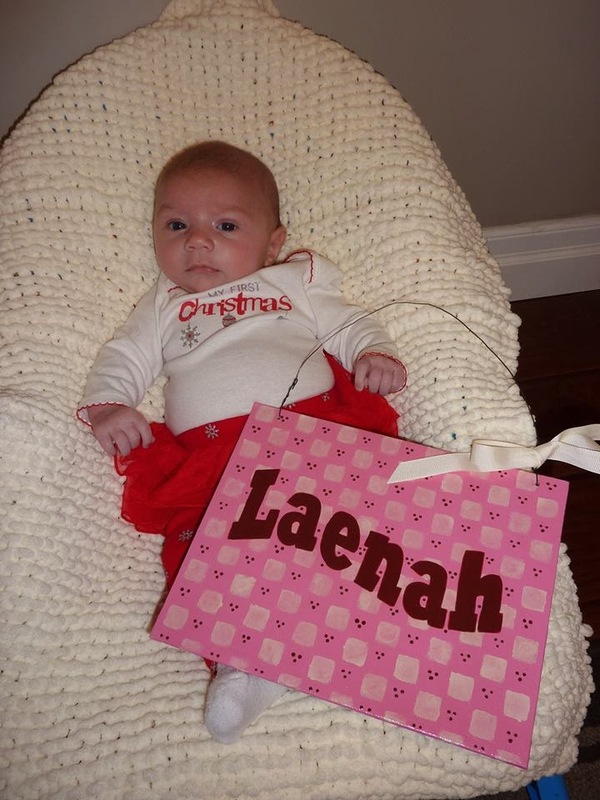 The latest gift for her is an 8" x 10" canvas board....base coated in acrylic paint, stenciled on top of that. 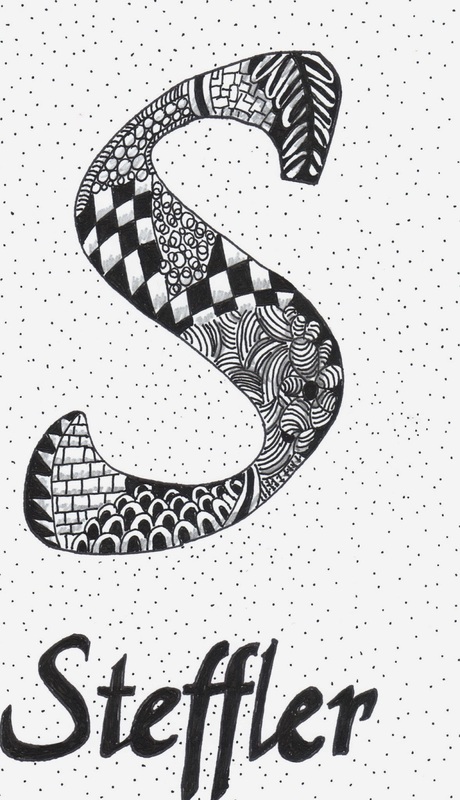 I added some little dots and then lettered her name. To finish it I drilled into the board and inserted wire and tied a grosgrain ribbon on it. It hangs on her bedroom door. Above is my design called a cozy cowl. It is a knit cowl that rolls up or down depending on your needs in the cold weather. My model loves it! 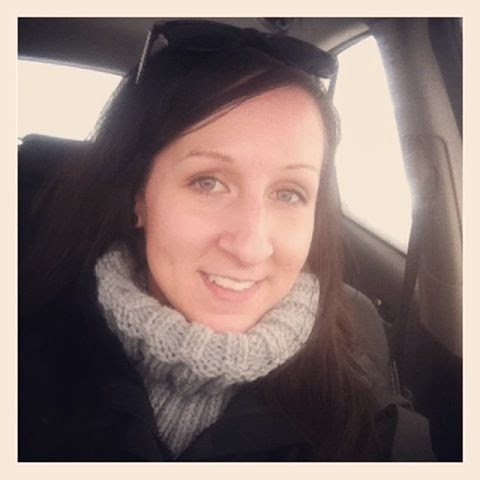 Here is an infinity scarf that I made with acrylic yarn. It is extra long so can be looped around the neck twice. It was a gift for the girl who does my hair. To go with his sports-themed room, here is a football ink art project. His Grandma framed it in a black frame for Christmas. This bookcase has been around for many years. It was pretty beaten up so I mixed some of my own chalk paint and went at it. Layers of paint later, I lettered the top with a quote that I liked. To finish it off, I used finishing wax. It is really durable and my bookworm daughter and her husband are using it already. Another ink art project. This is also a 5" x 7" size. The recipient is going to frame it in a glass borderless frame. 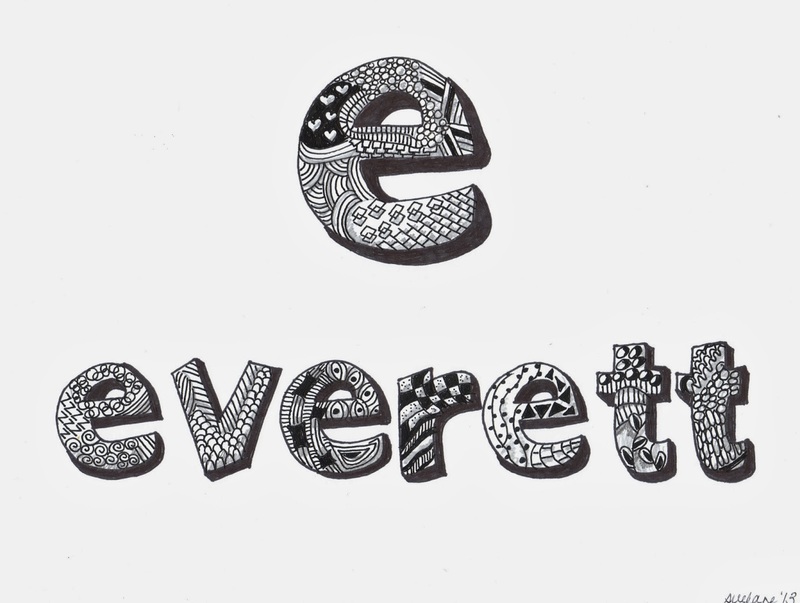 Their last name is encircled with designs. I knit this baby blanket with soft yarn. It is a fun pattern to do, you just keep increasing and then you start decreasing. There are lacy holes along the border to add to the design. Baby Kinley has a 5" x 7" canvas that I painted with acrylic paints. It is protected with varnish and has a tooth hook on the back for easy hanging. 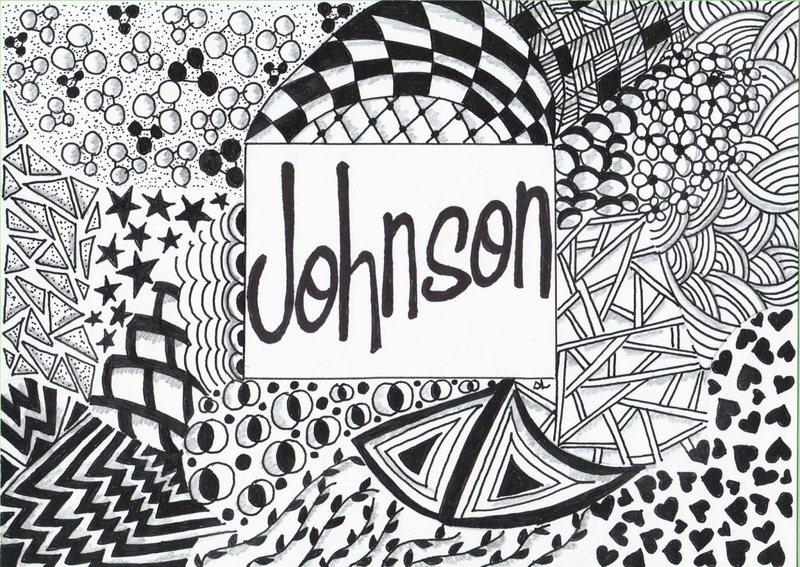 This 8" x 10" design is black ink on card stock. It is personalized for the couple. Another repurposed wood sign made for a housewarming/Christmas gift. Random lengths of wood that I distressed further, acrylic paint.....cleats on the back and hanging wire. These wreaths go by many names like rag wreaths or scrap fabric wreaths. I bent a heavy wire hanger into a circle and got going..... I tore lots and lots of fabric into strips that are about 2" wide (give or take). Then I cut the long strips into manageable-to-tie strips. Round and around I tied the strips, alternating (but not being too exact about it) different fabrics. When I was almost done I also cut teal grosgrain ribbon into strips and inserted those randomly around the wreath. The hook part of the hanger became a closed hook when I bent it with pliers. I hung this up using fishing line so you can't see that. This is long infinity scarf that I made using double strands of yarn for extra thickness. It can be worn long of wrapped twice around the neck. This is a black infinity scarf, nice and thick and warm that I knitted. 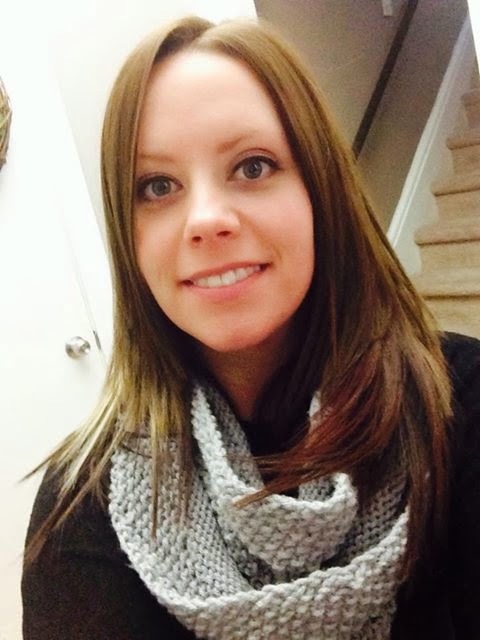 This infinity scarf is being modeled in the photo above. It is knitted making ribs. It can be worn up or down, just roll it to the size you want. 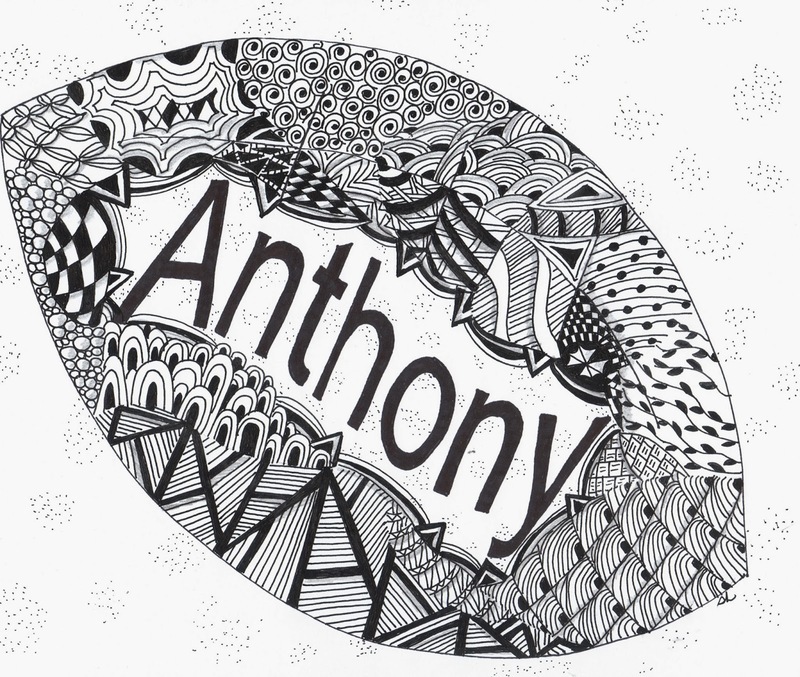 A personalized ink art project. 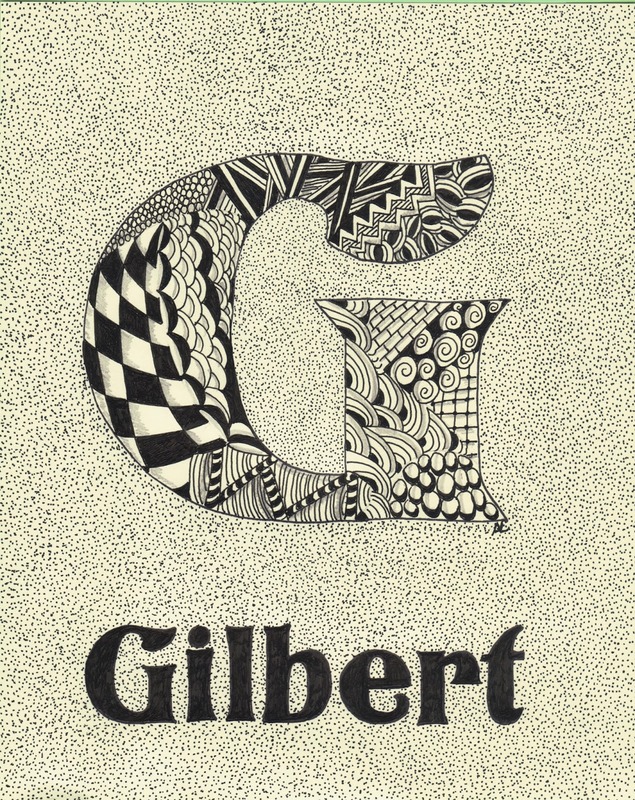 Black ink on card stock, unique design, family's last name. Lots and lots of little dots! Red knitted scarf, about 58" long and 8" wide. Nice and soft. 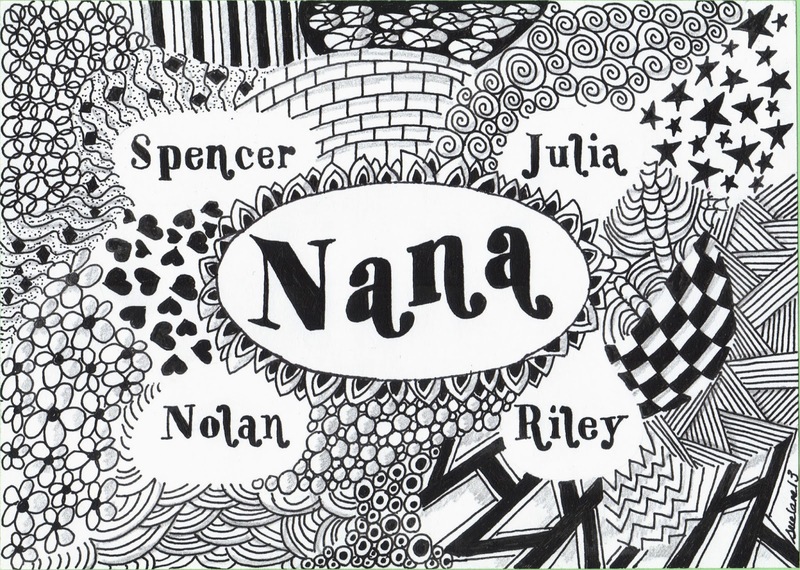 A Nana ink art project with the grandkids' names incorporated into the design. worsted yarn (the black one on the right). You can wear these rolled up or down. Super warm, fun to make! 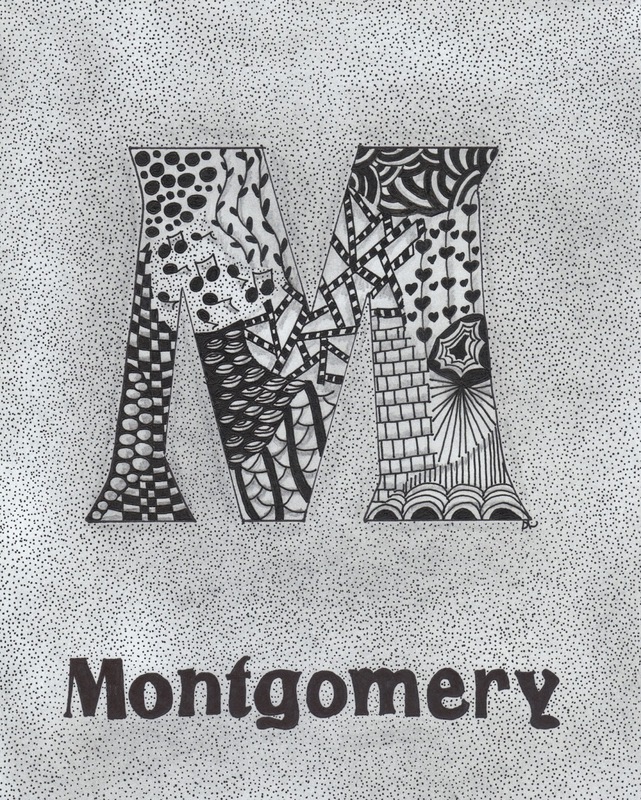 Another personalized ink art project with the family name and monogram. Lots and lots of dots in the background, too. This is 8" x 10" and has been framed. This is a matching set - ski band with tucking and infinity scarf. Knitted using worsted yarn. 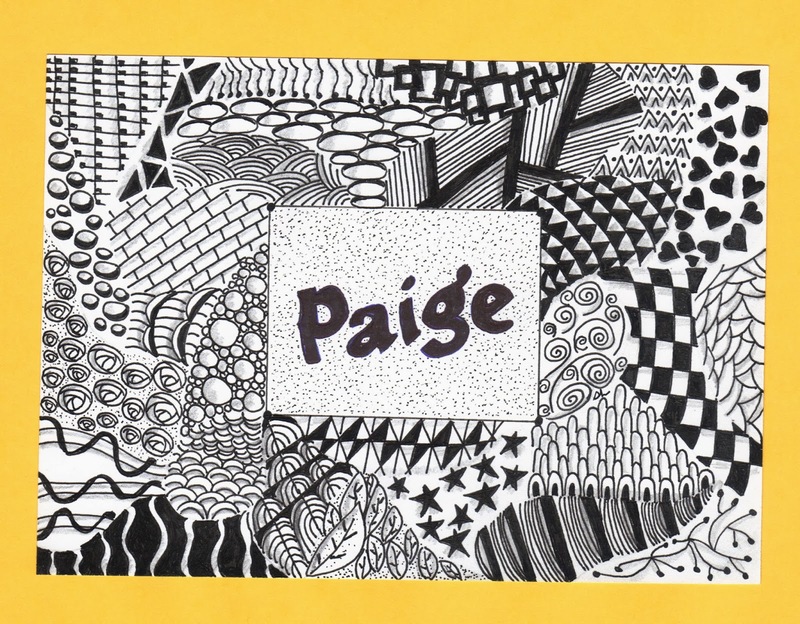 This personalized ink art project is done on 5" x 7" card stock. This shawl is made of baby yarn on large needles. It wraps around to keep you comfortable on chilly days. This is another personalized ink art project. It features the last name and a monogram S.
A new project that I have started is making magnets. I use small rigid canvas boards and do a base coat of paint. From there I distress it using gel stain. I have photocopied a photo on it and used Mod Podge to adhere it to the board. Finish off with a heart and name in acrylic then coat the whole thing with Mod Podge. On the back I have glued magnet strips and it's ready to put on the fridge! Another kiddie magnet made the same as above with paint, stain, and Mod Podge. It is important to get a photocopy made of the photo; if you use one you print from your ink jet printer, the ink will run. So I found getting a few of the photos photocopied on to one sheet gave me some extra in case I ran into any problems but the Mod Podge worked really well. I painted this large canvas as a donation to a silent auction that is being held at a local fundraising breakfast for a local family. I wrote the verse (c. 2014 Sue Lane). Acrylic paint basecoat and then dry brush make up the background. I used acrylic paint for lettering. For the star, I used Patio Paint textured paint and that made the star more dimensional. I came back with the navy paint and put 3 coats on top of the texture. To finish it off I brushed on satin varnish. There is a tooth hook on the back for hanging. 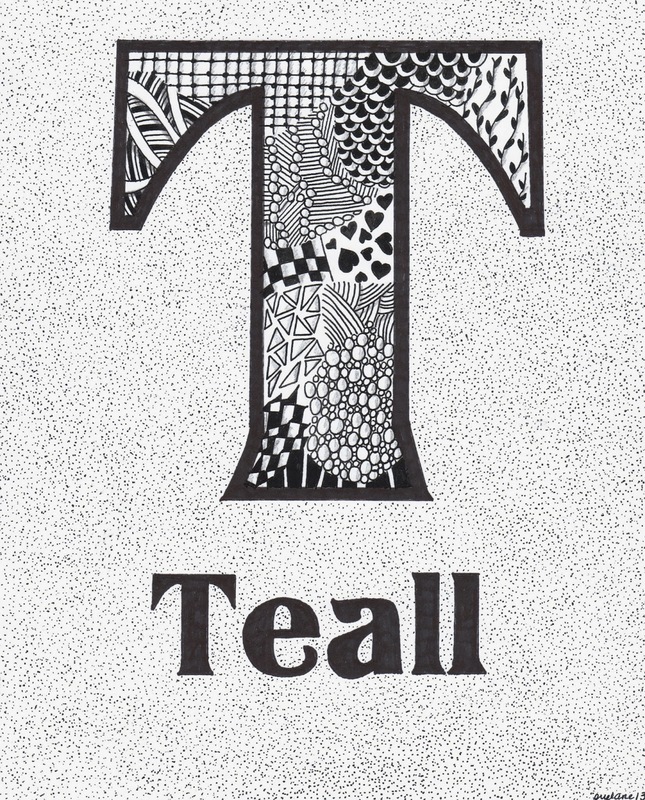 Another personalized ink art project in 8" x 10" size. I had made one for my neighbor. These are fun to make and one-of-a-kind. This large canvas is for Jake. I painted his favorite activities - football, hockey and guitar along with his name and hockey league. It is done using acrylic paint and varnish. There is a hook on the back for him to hang it in his room. This little canvas magnet is for Jellybean - the baby in the ultrasound. The technique is the same as the magnets above for Trevor and Asher. Currently I am working on some new projects - knitting and painting. I'll soon take pics of the newest designs and post them here. but I am not doing that all in one sitting...that would sure clog up the feed! And if you have a Pinterest page, I would like to follow you, too.